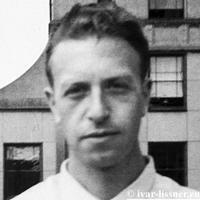 Ivar Arthur Nicolai Lissner (1909-1967) was born in what is now the Latvian city of Livani. After an unhappy sojourn in Russia the family returned to Riga, the Latvian capital and subsequently moved to Berlin. He joined the Nazi Party in 1933 and remained with it in spite of the fact that the Gestapo spent three years trying to prove his father’s Jewish ancestry until they dropped charges in 1940. Lissner had moved to Japan acting as a press attaché, in reality a double-agent for both the Nazis and the Soviets. Eventually, he was accused of being a Soviet spy and imprisoned and tortured but eventually acquitted by a Japanese court and released before the end of the war. After the war be developed his career as a journalist in Germany and France. He had authored a number of books before the war and continued writing afterwards. Two of his later books have been translated into English which deal with ancient civilisations, The Living Past  and The Silent Past. He supported the idea that Tartessos in Spain had been Atlantis, and extensively cites the work of Adolf Schulten in support of this contention.